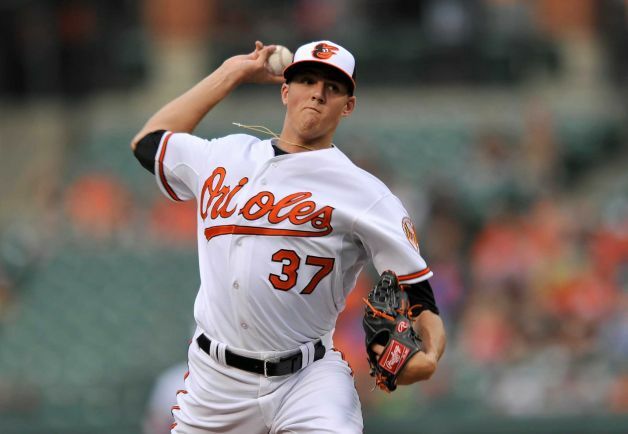 The Baltimore Orioles will option rookie starter Kevin Gausman to Triple-A Norfolk, following his outing against the Boston Red Sox on Thursday night, a game in which the Orioles would win 5-4 in 13 innings. The third-overall pick in the 2012 MLB Amateur Draft out of LSU, Gausman has moved quickly throughout the Baltimore organization and was the first player from last year’s first round to make his big league debut. In five starts this season, Gausman has posted an 0-3 record and 7.66 ERA, along with a 20/6 strikeout to walk ratio in 24.2 innings of work. Gausman worked 5 1/3 innings on Thursday night, surrendering two runs (a pair of home runs) and striking out five batters and walking none. Gausman has displayed flashes of brilliance in his outings this season, but has also shown his inexperience. He has the ability to develop a plus three-pitch arsenal with time, as he possesses a plus fastball and changeup that both explode in the zone with excellent movement. The Baltimore rookie will join Norfolk for the first time as the Orioles hope to refine his repertoire and better prepare him for the stretch ahead.